For her exceptional leadership as a scientist, writer, educator, communicator and advocate of tsunami research and preparedness, the Seismological Society of America (SSA) honors Lori Dengler with the 2017 Frank Press Public Service Award. Author and Professor Lori Dengler, left, reads from the book “The Extraordinary Voyage of Kamome” along with the book’s illustrator Amy Uyeki. Dengler, a Professor Emeritus at Humboldt State University, will receive the Press Award at Seismology of the Americas, a joint meeting of the SSA and the Latin American and Caribbean Seismological Commission (LACSC), to be held 23-26 April 2018 in San Juan, Puerto Rico. “California’s level of preparedness for earthquakes and tsunamis, particularly along the north coast that is part of Cascadia, is very much due to [Dengler’s] efforts to bring the science to the public, the local, regional, tribal, state and federal officials who must make and support preparations, and the emergency managers who have to deal with the effects of earthquakes and tsunamis,” said Peggy Hellweg, operations manager at the Berkeley Seismological Laboratory. For more than 30 years, Dengler has been a tireless force in preparing coastal communities in California and around the world for tsunamis. She participated in post-event field teams studying tsunamis in 1998 in Papua New Guinea, 2004 in Indonesia, 2010 Chile, and 2011 in Japan, among others, and as a result was a coordinating co-author on the UNESCO-IOC’s International Post-Tsunami Survey Field Guide. For the U.S., Dengler served as a member of the group that developed the National Tsunami Hazard Mitigation Program and authored the program’s initial Strategic Implementation Plan for Mitigation Projects as the Scientific Lead from California. On the regional level, Dengler was a founding member of the Redwood Coast Tsunami Work Group in 1996 to bring together local, state, tribal, and federal agencies, nongovernmental organizations and businesses to reduce and learn more about seismic risks along California’s northern coast. Living on Shaky Ground: How to Survive Earthquakes and Tsunamis in Northern California, a preparedness guide developed by Dengler, has become a model for similar citizen guides throughout California. In 2015, Dengler co-authored The Extraordinary Voyage of Kamome: A Tsunami Boat Comes Home, a bilingual Japanese-English children’s book about a small fishing boat that was swept across the Pacific Ocean by the 2011 Japan tsunami and came ashore in Crescent City, Calif., two years later. 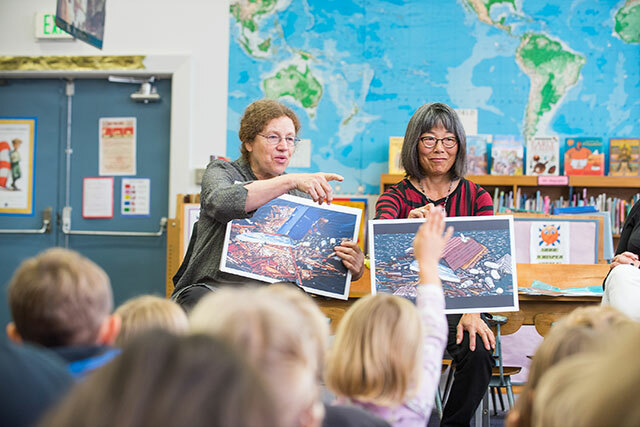 The book and a surrounding outreach project are the basis of a new school curriculum in California on earthquakes and tsunami preparedness. Dengler received her bachelor’s (1968), master’s (1973), and Ph.D. (1979) degrees in geophysics from the University of California, Berkeley. She has served as the director of the Humboldt Earthquake Education Center since 1986, was recognized as Humboldt State University’s Scholar of the Year in 2008 and was the 2009 recipient of the Alfred E. Alquist Medal for Outstanding Achievement in Earthquake Safety. The Frank Press Public Service Award honors outstanding contributions to the advancement of public safety or public information relating to seismology. This award may be given to any individual, combination of individuals, or organization. The call for nominations for next year’s Press award, along with a list of past winners, is available at the Seismological Society of America’s website, www.seismosoc.org.